Maurice Louca - Elephantine. Vinyl LP. Bleep. 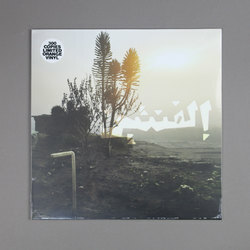 On Elephantine, his new album released exclusively on Rosa as vinyl LP, Cairo-based Maurice Louca guides a 12-piece ensemble through a 38-minute masterwork that might best be described as panoramic. Elements of free improvisation, Sun Ra's cosmic jazz, gorgeous Arabic melody, trancelike African and Yemeni music and minimalism meet in his wholly unique compositional vision. Louca also makes vital contributions on guitar and piano, and inspires stirring performances from a global lineup. One of the most gifted, prolific and adventurous figures on Egypt's thriving experimental arts scene, Louca has in recent years garnered a global reputation through two previous solo albums and an expanding, evolving lineup of genre-defying collaborations. The Wire called his 2014 sophomore solo effort, Salute the Parrot, "remarkable music-dense, driven and splashed with colour. "; In 2017, the self-titled debut by Lekhfa, the trio of Louca and vocalists Maryam Saleh and Tamer Abu Ghazaleh, was praised as an "edgy triumph"; in The Guardian and picked by BBC Radio's Late Junction as one of the very best 12 albums of 2017.